Randall (Randle) Mainwaring (Sir Randle Honkyn Randolfus Mainwaring Randall - various sources list his name as this or similar) of Over Peover, county Chester, heir to his elder brother John (died 1410). He was born no later than 1363, and died 1456-57 [35 Hen. VI] according to Ormerod. The marriage record of my great great grandparents Robert Taylor (1869-1912) and Mary Jane Timms (1869-1952) at St Paul's Church, Kirkdale on November 23 1892. For many centuries, from the time of the Normans, until 1919, one of the main families in my family tree, the Mainwaring's owned and lived at Peover Hall, in Over Peover, near Knutsford in Cheshire. The direct line in my family stretches back from before the Norman Conquest to 1615 when Anne Mainwaring married Sir Robert Brerewood. Below is the death notice for Stanley Alfred Becalick, my 1st cousin 2x removed taken from the Liverpool Echo Tuesday 29 October 1946, page 2. 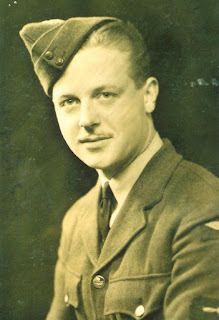 Stanley died in an accident serving with the RAF in Enniskillen on 26 October 1946. The second clipping is from the Belfast Newsletter at the time. He was due to be released from the RAF within two weeks when he was involved in a fatal motorcycle accident. He is buried with his parents in West Derby Cemetery. Joan Roberts was his fiancée. I recently made contact with his younger sister Pamela, who said that Stanley wanted to train as a pilot in the RAF but a heart murmur put pay to that. He was a talented classical pianist who also wrote music, and entertained the troops playing concerts. Stanley's mother, Gertrude Elsie Hindley, was sister to my great grandmother Ellen Eliza Hindley.
" BECALICK - October 26 in Northern Ireland aged 23 years. Stanley beloved fiancé of Joan (Smiles, tears, of all my life, and, if God chooses, I shall but love thee better after death.) "
RAF Killadeas on the banks of Lough Erne, seven miles from Enniskillen was home to the Catalina flying boats. In August I visited Norton Priory near Runcorn and was surprised to find in their museum the remains of my Dutton ancestors on display - a real Meet the Ancestors moment. Born in Chester to John Brerewood (1560 - 1599), the Sheriff of Chester in 1598, and his wife Mary Perry ( - 1592), Robert was Christened on 10 January 1588.In 1605, he was sent to Brasenose College, Oxford and later to the Middle Temple. He was called to bar on 13 November 1615, and practised for 22 years. Ernest Heywood was my great grandfather. He was born on 23 March 1877 in Blackrod near Bolton with his twin brother Arthur to William Heywood and Ann Boardman. He was baptised in Blackrod on 6 May 1877. He was still living in Blackrod in 1881, and still with his parents in 1891 at Newton Heath, Manchester. In 1901 he was living with his parents in Blackley, Manchester. In 1909 he married Ellen Eliza Hindley in West Derby, Liverpool. Together they had eight children including my grandfather George Ernest Heywood. In 1911 he was living with Ellen and their eldest daughter Hilda as lodgers in Burnley, Lancashire. In World War I he was Private 129197 in the Labour Corps before being discharged on 28 November 1917, after which he lived at 12 Brooke Terrace, Everton Road, Liverpool. His occupation on his death certificate was a general labourer. Ernest died on 30 May 1939 of myocarditis and chronic bronchitis. He was 62 years old. Paragraph 392 King's Regulations (xvi) No longer physically fit for war service. Army Order 265 paragraph 2b - those who, having served as soldiers and being still of military age, have been discharged under the conditions set forth at (i) and (ii) in (a): (i) after service overseas in the armed Forces of the Crown, on account of disablement or ill- health caused otherwise than by misconduct or (ii) after service at Home, and have been medically examined and finally discharged from liability to further military service under sub-section (5) of section 1 of the Military Service (Review of Exceptions) Act 1917, as permanently and totally disabled, otherwise than from misconduct. (i) Victory Medal victory medalGiven the information we have available it is likely that Ernest Heywood was entitled to the Victory medal, also called the Inter Allied Victory Medal. This medal was awarded to all who received the 1914 Star or 1914-15 Star and, with certain exceptions, to those who received the British War Medal. It was never awarded alone. These three medals were sometimes irreverently referred to as Pip, Squeak and Wilfred. From the information available to us, it is very possible that Ernest Heywood was entitled to the British War Medal for service in World War One. This British Empire campaign medal was issued for services between 5th August 1914 and 11th November 1918. Ernest Heywood lived on until 1939 with his wife Ellen Eliza Hindley. One of their sons was my grandfather George Ernest Heywood. Ernest is buried in an unmarked grave in Anfield Cemetery, Liverpool. Rhoda Eugenie Stephens was my great great grandmother. Earlier this year I visited the New Forest. Just outside the village of Boldre, near Lymington, at the top of the hill is one of England’s oldest churches - St John’s Boldre. It is surrounded by one of the country’s most beautiful graveyards. The church itself is close to 1000 years old. From me, the Jenvey line originates via my dad's dad, George Ernest Heywood. His mother was Ellen Eliza Hindley, and her mother Rhoda Eugenie Stephens. Her mother was Ann Jenvey Lockyer, who married John Stephens at Boldre Church in 1855. Ann and John relocated to Liverpool in the 1870s. Ann's mother was Sophia Jenvey, part of a long list of Jenveys from Boldre that I can trace back to the 1500s. St Margaret of Scotland is a direct ancestor of mine. The birthday card sent by my grandma Edna Taylor (1928-1984) to her brother George Taylor (1926-2010) for his 21st birthday on 22 September 1947. On 26 June 2002, in an address to the Armed Services to commemorate her Golden Jubilee, Her Majesty The Queen stated that "in Britain we remember those no longer serving, including those who have died for their country; for we in this nation have a deep and abiding respect for our past". It is a fundamental characteristic of human nature to remember and commemorate the fallen, not merely for the sake of our own peace of mind, but also for the instruction of future generations that they might recognise the price of freedom. 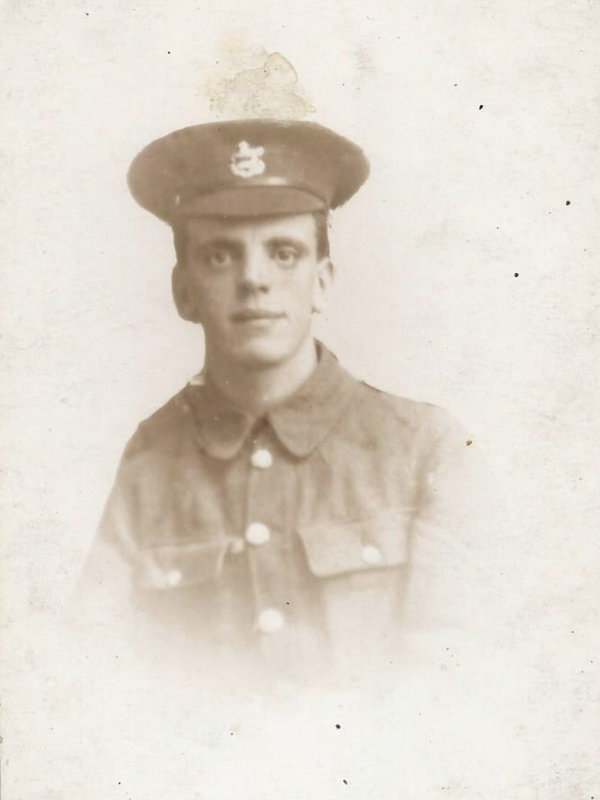 Born in Liverpool on 10 December 1894, Lance Corporal George Edward Hindley, my 2x great uncle, was the youngest son of Richard Henry Hindley (1858– 1941) and Rhoda Eugenie Stephens (1857 – 1907). During World War 1, he served with the 9th Battalion The King’s (Liverpool Regiment), service number 330190. George was killed in action on 28 August 1918, during the Battle of the Scarpe in northern France. He is remembered on panels 3 and 4 of the Vis-en-Artois Memorial, 10km southwest of Arras in the Pas de Calais. The Battle of the Scarpe took place between 26 and 30 August 1918. The 9th Battalion arrived in Henin on the night of the 27th, and took over the line during the night. At 12.30pm on the 28th, an attack was made with Reincourt their final objective. The contact aeroplane received a direct hit. The first objective was reached with no strong resistance. At 1.50pm, the advance continued towards Hendicourt-les-Cagnicourt. There was severe fighting as the village was being heavily shelled. Lt. Williams decided to withdraw. Groups of many Battalions were involved and consequently mixed up. Many attempts were made to effect communication with the 171st Brigade, but, owing to casualties to the Battalion runners during the advance, they were not successful. Positions gained were held despite very heavy shelling and machine gun fire. In this operation, one Major was killed, 11 officers wounded, and 231 other ranks (including George) became casualties. "2nd Battle of Arras: 28th August: Order received at 6am attack that day. First objective Hoop Lane, then the village of Riencourt. At 12.30pm, the barrage came down and men moved forward. Going not easy because of wire and numerous shell holes. Shortly after 12.30, the contact plane crashed because of a direct hit. Very heavy machine gun fire from Copse Trench. Fag Alley was reached and prisoners taken or killed. About 1.50pm, the Battalion continued the advance from the first objective and swung left in the direction of the village of Hendecourt. Resistence strong. Machine guns captured several men. Entered Hendecourt, but no other British soldiers there so withdrew to Cemetery Avenue, although under heavy fire from Crows Nest. In the evening, field gunners were firing at close range. Troops got mixed up and commanders on the spot organised what men they found. The Battalion remained there until noon next day when withdrawn to Copse Trench and then to Henin. A and C companies were depleted.". George Edward Hindley is also commemorated in the Hall of Remembrance in Liverpool Town Hall panel 51 right. Thank you to George and all the millions of others who gave (or were willing to give) their lives so that we may freely live ours. George was the brother of my great grandmother Ellen Eliza Hindley who married Ernest Heywood. Their son, George Ernest Heywood was my dad’s dad. Remembering my grandma Edna Taylor, later Heywood, who died 10 November 1984. Samuel Taylor Saunders was my 2x great uncle. He died in Cape Town on 4 January 1902 of enteric fever, a type of typhoid, believed to have been caught while swimming in a flooded river. John Johnson was my 2 x great uncle. John served with the 4th Battalion King's (Liverpool Regiment), and was killed in action at No 20 Casualty Clearing Station, France, on the Hindenburg Line, on 20 May 1917. Remembering my 2x great uncle James Henry Wilson, who died of gunshot wounds (shattered arm) in France 20 September 1918. Captain Thomas Gamul was my 9 x great uncle. He was born on 22 April 1627 to Sir Francis Gamul and his wife Christian (born Grosvenor), and was baptised four days later. He was a Royalist army captain in the English Civil War, and was killed, aged 17 at the Battle of Tipton Green on 12 June 1644. Burial record for my 5x great aunt Eliza Glenton (1792-1863). Buried 15 January 1863 at Holy Trinity Church, Liverpool. Pepin or Pippin (or Pepin Carloman, Pepinno, April 773 – 8 July 810), born Carloman, was the son of Charlemagne and King of the Lombards (781–810) under the authority of his father. He is a direct ancestor of mine. Born on 17 December 1726 in Liverpool to Alderman Richard Kelsall and his second wife Sarah King (nee Bankes), Brooke Kelsall was Christened on 9 January 1727 at St Nicholas church in Liverpool. On 4 September 1749, (in the same month that his father died), Brooke married Elizabeth Tarleton (1725 - ), daughter of Joshua Tarleton. Three years later, Brooke was the captain on board the slave ship Hector, a 200 tonne boat armed with six mounted guns. The war medals of George Edward Hindley and John Henry Hindley were sold at auction by Lawrence's auction house on 3 November 2011 for £110 and £85 respectively. These brothers were my great great uncles. The lots included a photo of them. I would love to either see this photo or if possible bring the medals back into the family. A long shot but if anyone knows who bought them can they get in touch please by the contact form at the bottom of this page? The catalogue entries are shown. Thank you. UPDATE November 2018 I have made contact with George’s niece and although I have no information on the medals, I now have a photo of George, on the link shown at the top of this article. Sir Philip Mainwaring was born in 1589, the 7th son of Sir Randle Mainwaring (1553 – 1612) of Over Peover, Cheshire and Margaret Fitton ( - 1612), daughter of Sir Edward Fitton of Gawsworth, Cheshire. He was educated at Grays Inn 1609; Brasenose College Oxford 1610 - 1613; and travelled abroad. He was knighted on 13 July 1634. Sir Philip never married. In the early 1700s a shoemaker called John Saunders married a lady called Catherine. One of their children was Thomas (1758-1820) a labourer who married Ann (Nancy).